The federal agency said the candy darter has lost nearly half its population since the 1930s, which is when it was identified in parts of southern West Virginia and western Virginia. A rainbow-colored fish that’s considered among the world’s most beautiful in freshwater and found only in picturesque Appalachian streams has been listed as “endangered,” the U.S. Fish and Wildlife Service announced Tuesday. The federal agency said the candy darter has lost nearly half its population since the 1930s, which is when it was identified in parts of southern West Virginia and western Virginia. The seldom-seen fish are about the size of a cigar and often lined with vibrant bands of teal, red and orange. “It looks like an ornamental fish that you’d buy at the pet store from some exotic region of the world,” said Jordan Richard, a U.S. Fish and Wildlife biologist who studies the candy darter. The candy darters’ population first took a hit from logging and other human endeavors last century that had pushed dirt into the water, Richard said. The sediment filled open spaces between rocks in stream beds where candy darters live and feed on bugs. The dirt also disturbed the sandy areas where eggs are laid. 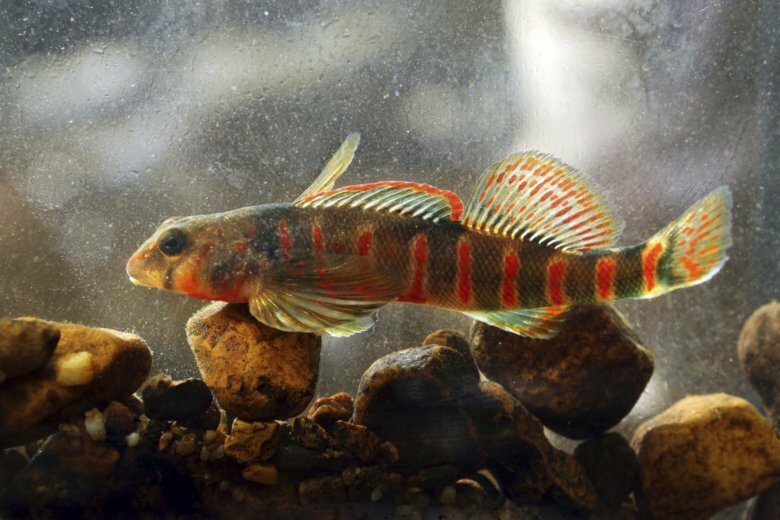 But the biggest threat to the species is what’s known as “hybridization.” Another species of darter fish, the variegate, was somehow introduced into sections of streams where candy darter live. The variegate darters, which are more orange-and-black colored, have been mating with the candy darters. Richard said the exact cause of the hybridization hasn’t been determined. But he said a fisherman could have dumped out a bait bucket containing variegate darters into streams where candy darters live. The two species are often separated by natural barriers such as a waterfall. The variegate darters are mating with the candy darters in the watershed of West Virginia’s Greenbrier River. And they’re threatening to enter streams connected to the Gauley River, also in West Virginia. So far, a dam seems to be keeping them out. “They’ve made it all the way up to the castle wall and they’re knocking,” Richard said. In Virginia, candy darters are found in only four places, all of which are in the New River watershed. Those areas have not been infiltrated by the variegate species. The listing under the Endangered Species Act means that more resources will be dedicated to protecting the fish. For instance, more money could be available to fund research to possibly address the hybridization problem. And it could boost programs to breed the fish and reintroduce them to streams where they’ve disappeared. The Center for Biological Diversity and other environmental groups had petitioned for federal protection of the fish in 2010. The center said it then sued for protection in 2015. “They’re kind of like the Nemo of the freshwater world,” said Tierra Curry, a senior scientist at the center, in reference to “Finding Nemo,” the 2003 animated film about a colorful clownfish.